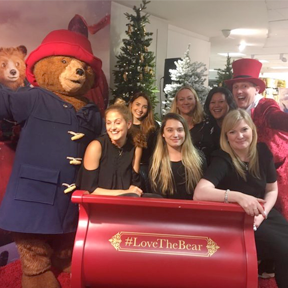 This week, we hear from Alastair and his thoughts on how effective storytelling and emotive content can really connect a brand with its audience using his recent trip to Disneyland as a basis. Nobody does emotion quite like Disney… That’s what I thought to myself as I stood on “Main Street”, the fictional town centre that funnels guests at Disneyland Paris towards that famous castle where “dreams really do come true”. And as the fireworks resounded, and my daughter, sat atop my shoulders, sang the lyrics to her favourite songs at the top of her little voice, I’ll admit that a tear came to my eye, and a lump to my throat. This, of course, was the famous Disney Illuminations show, that closes the park every night, as it does in the various Disney locations the world over. 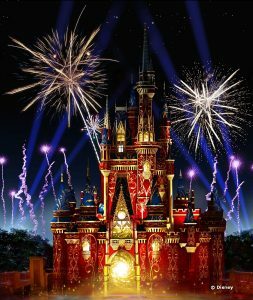 The Disney parks are famous for their dazzling fireworks displays. But the nerdy part of me that never stops looking for things that would work well at events noticed something that took me by surprise… there weren’t that many fireworks. 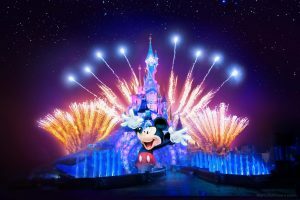 Those clever folk at Disney have clearly realised that fireworks are expensive, and by lighting up the night sky in all of their parks, they were burning up their profits. So they’ve turned to technology; instead of having the display over the castle, they’ve put the display on the castle. With the most incredibly effective projection mapping, coupled with ingenious lighting design (as well as a few well-placed bursts of pyrotechnics), Cinderella’s house becomes a blank canvas for a show that allows many of our most loved animated characters to come to life. Parts of the castle seem to move before your eyes, at one point a waterfall flows from top to bottom, before the whole castle becomes engulfed in flames. When Elsa’s bridge appeared to introduce the Frozen section, my spellbound daughter asked me, with genuine wonder “how did that get there?”. She had no idea how it was being done, the sign of great event technology. But then the other part of my brain kicked in, the one that doesn’t care about technology, the one that cares about the look on my daughter’s face, the feeling inside my chest, the tears running down my wife’s face as she got to share this experience with her children. And as I looked around at the other families who were sharing in that moment, I realised that it wasn’t the technology that was bringing those emotive reactions, it was the carefully crafted story, that saw Mickey Mouse (still Disney’s MVP) wend his way through the various animated landscapes. You see, as great as the technology is, without the storyline, without those beloved characters and those soaring songs, it means nothing. As events professionals, we’re often tempted by technology, and we’re always looking for the next cutting-edge way to bring an event to life. There is no doubt that technology can be used to enhance the emotion, but we have to place greater emphasis on getting content right. We shouldn’t be afraid to challenge clients on their content, if we believe the story can be better served. Because it’s in the content that the emotion is born. It’s what a leader says that makes people want to follow them, not the technology behind them. So back to me standing in front of Cinderella’s castle. What Disney have done perfectly with their Illuminations show is used jaw-dropping technology to enhance the story, not overtake it. Although I hate myself a little for analysing every detail of a show I should have just been enjoying like anyone else, if it makes me better equipped to help tell a great story alongside some great technology, then so be it.